Madrid: Barcelona will head to Levante on Sunday night top of La Liga and with a score to settle. Seven months ago, they were two games away from becoming the first team to finish a Spanish top-flight season unbeaten since Real Madrid in 1932, and even then there were only 18 games in a 10-team division. 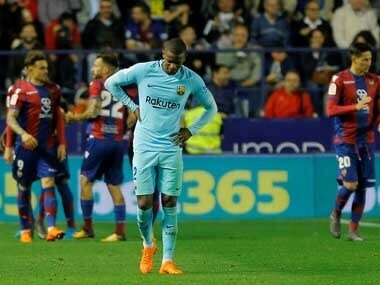 It would have been a remarkable feat, a feather in the cap for their coach Ernesto Valverde to help soothe the pain of a quarter-finals exit from the Champions League. But Levante had other ideas, scoring three times in 10 minutes to lead Barca 5-1 before prevailing 5-4. 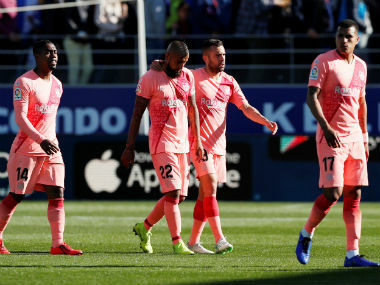 "We are angry not to have come through this game and to lose the opportunity to finish unbeaten," Valverde said. On their way to qualifying for the last 16 of the Champions League this time, Barcelona drew at home to Tottenham on Tuesday when Valverde took the chance to rest several key players, including Lionel Messi, Jordi Alba, Luis Suarez, Gerard Pique and Marc-Andre ter Stegen. The irony is they will be fresh this weekend for the same opponent many believed knocked the stuffing out of them last season, three days before their collapse to Roma. 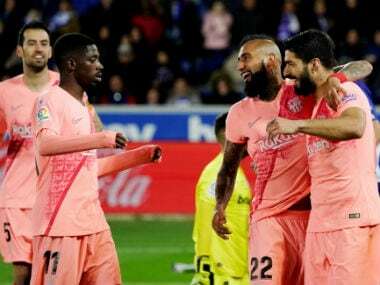 Perhaps Valverde has since heeded accusations he was naive, that he chased the unbeaten season when rotating his players could have helped them go further in Europe. He has appeared keener to make changes this term and in those games, Barcelona have also dropped points. Just as Levante tore them to shreds on the break, Barca still look vulnerable against speed. Sergio Busquets has been exposed. Gerard Pique has been off the pace. If La Liga was ordered on fewest goals conceded, Barcelona would sit 13th. Levante might feel the plan they executed so brilliantly back in May still holds. The surge away from the relegation zone under Paco Lopez has been maintained and the team currently sit seventh. Barcelona's vulnerabilities can be more easily shrugged off while they are the league's frontrunners and those around them have problems of their own. Real Madrid also rested players against CSKA Moscow on Wednesday but lost 3-0 at home, the Russians becoming the fifth side to score three or more against them this season. And while Ousmane Dembele's sloppiness off the pitch continues to vex Barca, Real have their own unruly attacker in Isco, who was whistled by his own fans during the CSKA defeat and allowed his frustration to boil over. "What do you want?" he seemed to shout at one point towards the stands. Later, he passed up the captain's armband too. "I tried to give the armband to Isco," said Marcelo, adding, "he told me that I had to give it to Dani Carvajal, why I don't know." 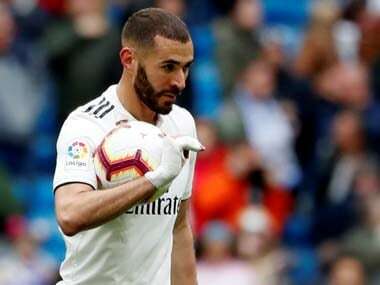 Madrid should have little trouble against their city neighbours Rayo Vallecano on Saturday, which will be their last league game before setting off for the United Arab Emirates and the Club World Cup. Atletico Madrid have fewer problems at the back and more up front, where goals, particularly away from home, have been hard to come by. Barca and Real's troubles are there for Atletico to exploit but if they are three points off the top when their rivals have stumbled, how will they keep pace when they inevitably improve? Sevilla, in second, have taken advantage. They host Girona on Saturday while Valencia hope to retain momentum after beating Manchester United in the Champions League in midweek. They play away to Eibar.